Inside Scoop: If you want the most delicious, crispiest and healthiest best baked sweet potato fries ever, try this life hack! 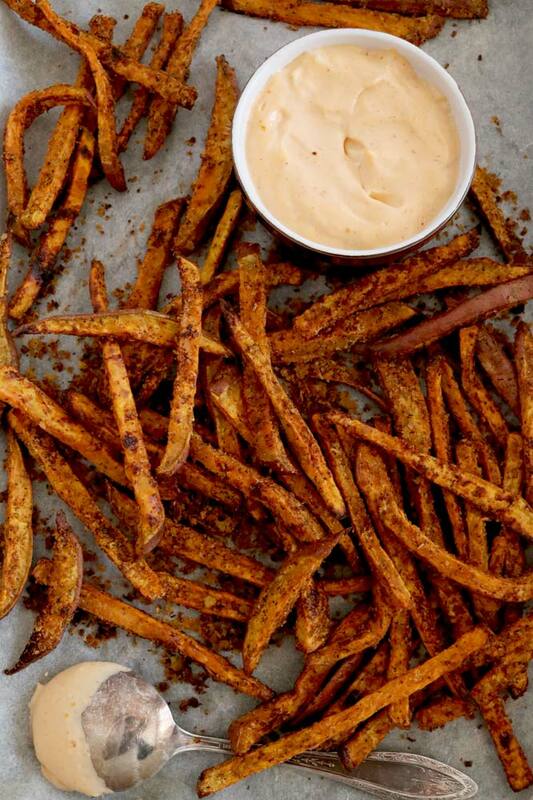 Guaranteed you will never do sweet potato fries any other way. 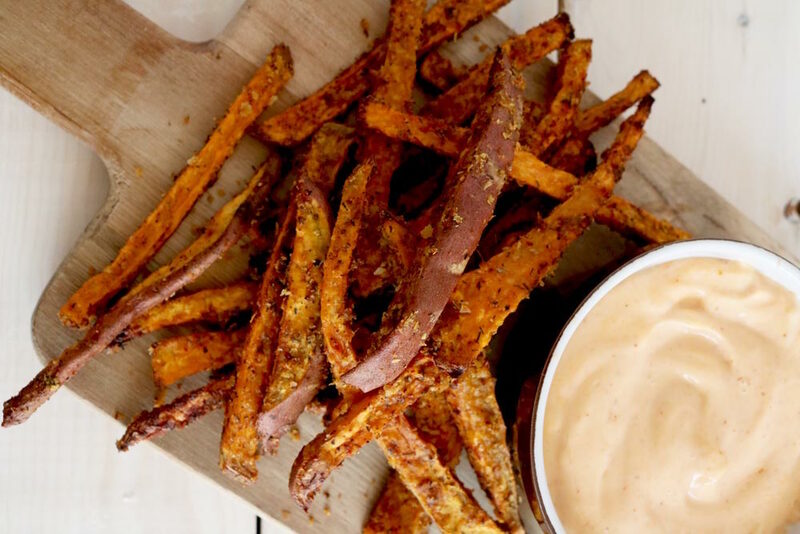 It’s taken awhile, but we’ve figured a way to get the best baked sweet potato fries ever! I started baking sweet potato fries on a regular basis for my toddler. It was that one thing that she asked for nearly every day, it was so easy to do, and I knew she was taking in some pretty awesome nutrients. So, perfecting the sweet potato fry was definitely something that came naturally. And I thought, well, how can I make these ‘cheesy’ without the cheese factor? Of course adding nutritional yeast, right? Why did I not think of this sooner? 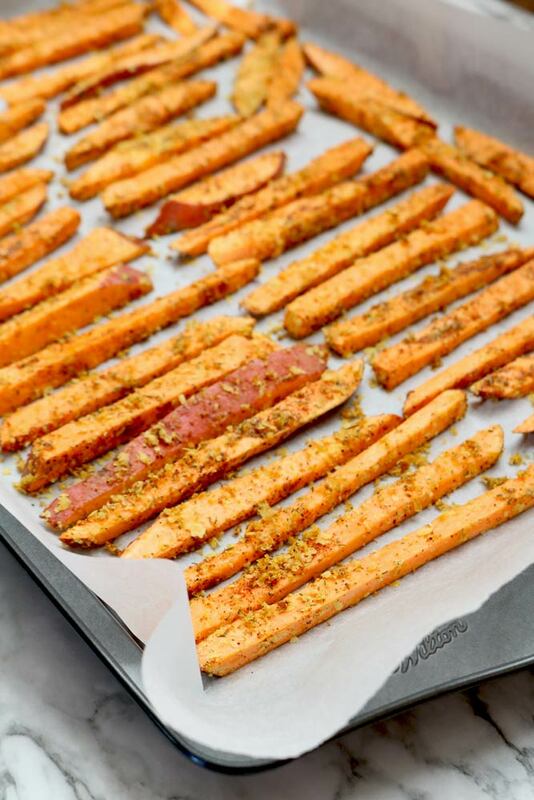 Adding nutritional yeast to sweet potato fries, pre-bake has been the easiest way to make them unbelievably delicious! It’s so simple, nooch (as ‘they’ call it) creates a cheesy and nutty taste, so it adds that element to the fries that take them up a notch (a nooch notch if you will), and it’s just 1 incredibly effective ingredient. Hint hint, this hack works for French fries, roasted veggies AND these Crispy Baked Chicken Thighs. If you’re not in love with nutritional yeast yet (vegan or not), do yourself a favour and get on board, this stuff is the best! 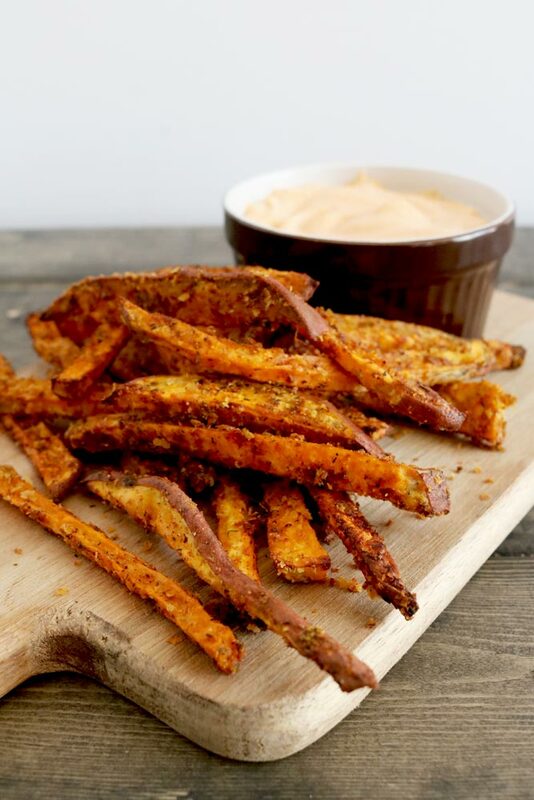 You can also check out these Jicama Fries with Dijon Dill Yogurt Dip for more baked fry & dip inspiration. HERE ARE SOME OTHER TIPS TO TAKE YOUR FRIES FROM SOG TOWN TO FLAVOUR TOWN, AND CREATE THE BEST BAKED SWEET POTATO FRIES EVER! Soak or par-boil your potatoes. This releases a bit of the starch so that the potatoes crisp and brown nicely. Soak anywhere from 30 minutes – overnight. Make sure you rinse your potatoes and pat dry before oiling. Don’t overcrowd. The potatoes need personal space, just like us. The more crowded they are the soggier they come out. It’s a bit of an extra effort, but if you need 2 pans, it’s totally worth it. Cut skinny. If you’re going to skip the pre-soak step (which we do often, no lies) then we definitely recommend cutting the potatoes like shoestrings. This makes it easier for them to get an even bake, and it’s less work to get crispier on the outside and soft on the inside. Don’t over oil. The more oil, the soggier. You just need enough to lightly coat your potatoes (same goes with veggies). We also recommend using a higher smoke point oil like Chosen Blend Avocado Oil. If you’re looking for some dinner inspiration, these Best Baked Sweet Potato Fries go incredibly well with this totally grill-able Vegan Black Bean Burger. Just making all your healthy burger and fries dreams come true. Have you guys tried our nooch trick? Comment below, we promise you’re going to love! 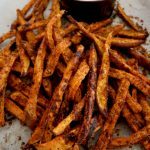 This one sweet potato fry hack will get you the best tasting, crispiest, healthiest and easiest baked sweet potato fries out there. Place all your seasoning in a dish and mix together. Cut your sweet potatoes in long and skinny fries (you can keep the skin on, or peel). We usually do this by cutting down one side, and using that new flat side as a base to hold your sweet potato down. The skinnier the fry, the better it bakes. 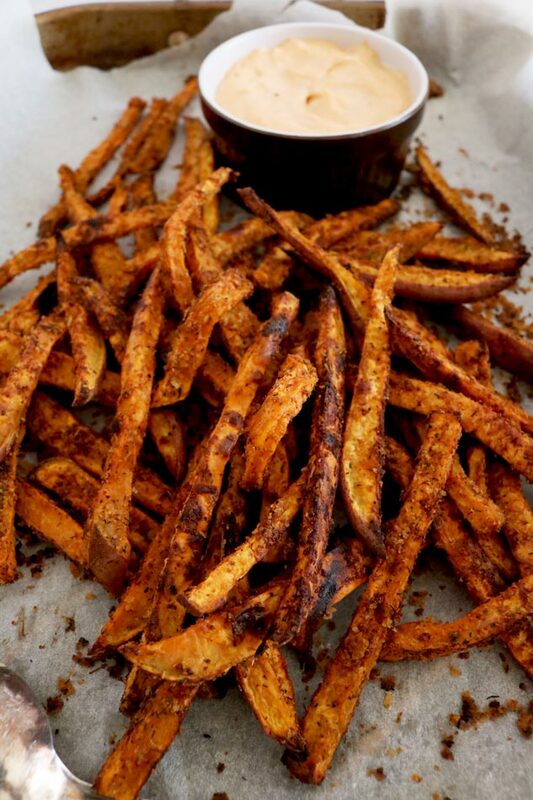 Place sweet potato in a large bowl to mix, drizzle oil overtop and then your seasoning. Toss the fries thoroughly, so all of them are coated with oil and seasoning. Take a large baking tray and line with parchment paper (you may need 2 trays depending on size). Place the sweet potatoes in a single layer (with space between them) on your tray. This step is crucial for the best baked fries, when you overcrowd they end up coming out mushy. Bake for 20 minutes, turn your trays around in the oven, and bake for another 10 minutes. They should come out a bit crispy, if they feel soft, cook another 5 min.